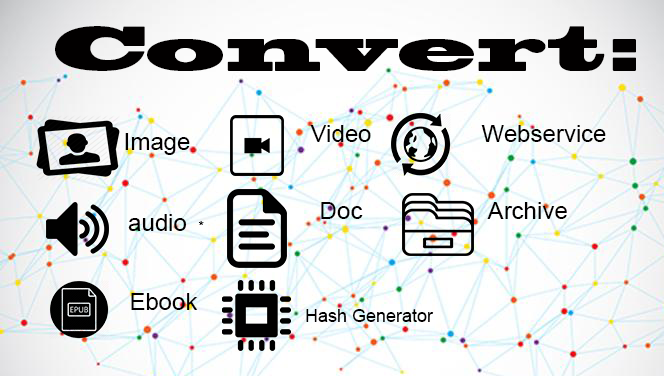 I Will Convert files Audio,video,Audio,Image,Document,Ebook,webservice,Archive from one format into another.Convert a file from one format to another. Thank you for choosing the conversion format below:+Audio converting: AAC, AIFF, FLAC, M4A, MMF ringtone format, MP3, OGG, WAV, WMA.+Video converting: 3G2, 3GP, AVI, FLV, Matroska(MKV), Quicktime(MOV), MP4, MPEG-1, MPEG-2, OGV, WebM(VP8), WMV, Android devices, Blackberry, Ipad, Iphone, IPod, Nintendo 3DS, Nintendo DS DPG, Playstation3(PS3), PSP, Nintendo Wii, XBOX 360.+Image converting: BMP, EPS, GIF, EXR format.Hig dynamic-range(HDR), ICO, JPEG, PNG, SVG, TGA, TIFF, WBMP, WebP.+ Documents converting: PDF and other documents to word, DocX, Flach slideshow, HTML, Open-office ODT, document and images to PDF, Powerpoint, Powerpoint PPTX, RTF, Document to text.+ Ebook converting: Kindle AZW 3 format, epub, ebook FB2, Microsoft LIT , Sony LRF, MOBI, PDB,TCR.+Webservice converting: Dailymotion, Facebook, Instagram, Telegram,Twitch, Twitter, Viber,Vimeo, WhatsApp, Youtube. Inbox me now and get the best.